On an average, disasters killed more than 1.2 lakh people and affected more than 135.5 million people every year between 1971-1995. Floods killed the maximum number of people in Asia, particularly in China and Bangladesh. In Africa, drought and famine continued to dominate, accounting for almost one-third of the disaster events. Ethiopia and Sudan were the worst hit. 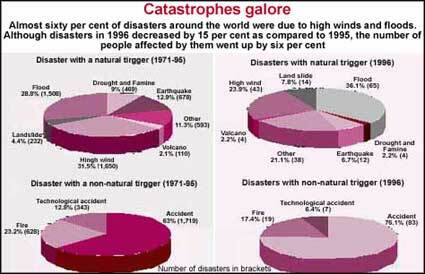 Significantly, the number of non-natural disasters, including industrial accidents and major transport accidents, has gone up by 18 per cent since 1995. More non-natural disasters highlight the need for increased vigilance in work and traffic safety practices.